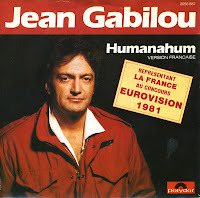 Jean Gabilou was born in Tahiti and became the first singer from French overseas territory to represent France at the Eurovision Song Contest. He did so in 1981, with the song 'Humanahum'. The title may seem nonsensical, but the message is quite serious: the lyric is about an old man teaching a group of children about life on Earth. Gabilou sings that because humanity 'invented the war', the Earth eventually could not support life. The song, therefore, is a plea for global peace. The song finished third in the contest, out of 20 competitors. France famously opted out of the Contest the next year, with the national broadcaster calling Eurovision 'a monument to inanity'. France returned in 1983 with a different broadcaster sending the artists.